Chaps Pit Beef’s unique grilling technique and special seasoning has garnered the BBQ franchise a lot of attention over the years allowing it to rapidly grow into the successful BBQ franchise that it is today. Donna Creager and her husband Bob started Chaps Pit Beef in 1987 and today its brand is recognized around the world. Here is a history of how Chaps Pit Beef transformed from a small Baltimore BBQ spot into a rapidly growing regional BBQ franchise. Chaps Pit Beef opens on Pulaski Highway in Baltimore, MD in 1987. They proceed to perfect their signature Maryland BBQ Pit Beef style over the next 16 years, going from roadside BBQ shack to local pit beef BBQ hotspot. In 2003, Chaps Pit Beef appears on season 2, episode 8 of the television show, The Wire, an American crime drama that ran from 2002 to 2008. The show focused on the narcotics scene in Baltimore. Chaps Pit Beef had to shut down for two days of filming. This cameo put Chaps on the map of local and national fans of The Wire, growing business overnight. The Food Network’s Diners, Drive-ins, and Dives first airs in April of 2007. Guy Fieri travels the country looking for the best roadside diners, drive-ins and dives. The first time Fieri of the Food Network’s Diners, Drive-ins, visits Chaps Pit Beef he is looking for homemade sauces, but he is so impressed by their grill process and history that they becomes the focus of their appearance of the episode “In the Family”. Chaps soon finds itself fielding calls from other countries from people curious to try a Chaps pit beef sandwich. Guy Fieri was so impressed with Chaps’ pit beef sandwich that he named it the best thing he ever ate on the episode of “Between Bread” of The Best Thing I Ever Ate on the Food Network. The show is an ultimate guide to the country’s most amazing dishes from the biggest food stars and chefs and helps link Chaps’ name with other hot eateries around the country. The Travel Channel’s No Reservations hosted by Anthony Bourdain where he goes on a global guest to explore local dishes and customs aired between 2005 and 2012. In 2009, Bourdain features Chaps on his show, No Reservations in the episode “Rust Belt” on June 27, 2009. He sits down with Donna Creager and her husband and enjoyed a pit beef sandwich. Creager said that he loved it, calling it very unique, that he saw similar grilling techniques in other countries, but not here in the U.S.
With both Fieri and Bourdain talking about Chaps’ food now, the Creagers continues to see record growth in their business. Soon other big names in the culinary world start to become curious about Chaps too. In 2009, Adam Richman of the Travel Channel’s Man v Food stopped by to see what all the fuss was about. During Man v Food which first went on the air in 2008, Richman travels the U.S. to sample iconic regional dishes and take intense food challenges. Creager said, “Richman was impressed with their grill. Not many restaurants use an open charcoal grill just like an old-fashioned cookout, especially in the U.S.” With Richman’s seal of approval, the Chaps Pit Beef brand becomes even more recognizable across the country. In a Diners, Drive-ins and Dives episode in October, 2012 dubbed “Flavortown Medley” Fieri explores flavorful dishes in Memphis, Haleiwa, Hawaii and Baltimore. Chaps Pit Beef sees more customers come in the door from far and wide wanting to taste a pit beef sandwich. In the “Super Sandwiches” episode of the Food Network’s Diners, Drive-ins, and Dives, Fieri again highlights Chaps’ grilled sandwiches. As Chaps hits rock star status, the Creagers start to think about expanding to become one of the top franchises in the world of BBQ. The Baltimore Sun covers Bob Creager’s announcement on opening a second location within 6 months and expanding the business into 60 locations over the next five years, and his partnership with MBB Management. Chaps Pit Beef was ready to let the world know that it was ready to spread their wings. On August 26, 2015, Chaps Pit Beef appears on an episode of the Travel Channel’s BBQ Crawl called “Baltimore Pit Beef and Pam the Butcher”. Canadian barbecue champion Danielle Dimovski takes a trip through the Southern U.S. to reveal America’s grilling roots and of course has to stop for some Baltimore pit beef at Chaps. The show first aired in 2013. The Huffington Post on September 17, 2015, published an article about the 9 Baltimore restaurants to visit from Diners Drive-Ins and Dives and Chaps Pit Beef is listed for its iconic Baltimore pit beef. Each mention of the special quality of Chaps Pit Beef’s food and service opens the doors for more franchising opportunities. The SAVEUR also publishes a piece on Chaps Pit Beef on March 2, 2016 entitled, “Crab, Pit Beef, and Berger Cookies: The Essential Snacks Of Baltimore”. The article highlights the history of Pit Beef in Baltimore and how Chaps Pit Beef has secured its spot as the best Baltimore pit beef in town. Andrew Zimmern, host of the Travel Channel’s Bizarre Food: Delicious Destinations, in an episode called “Baltimore” highlights all the original flavor that can be found in a blue collar city like Baltimore. Chaps Pit Beef is one of the top stops he makes along with getting some blue crabs and Berge cookies. Zimmern wanted people to know that he had to stop at Chaps Pit Beef to get a beef sandwich while he was in town, Creager said. As more people learn about the unique beef sandwiches at Chaps, the demand for the restaurant to expand to other communities grows. On a later episode of The Food Network’s Diners, Drive-ins, and Dives called “Big Bites”, Fieri revisits Chaps Pit Beef, this time to take a bite out of one of their skyscraper sandwiches. Once again Fieri shows the world that no one does beef sandwiches like Chaps Pit Beef. When Andrew Zimmern hosts his new show, The Zimmern List on the Travel Channel, where he reveals his top picks for the best food he has experienced on his travels, of course, Chaps Pit Beef is on the list in “Baltimore”, season 1, episode 15 in May of 2018. When people think of Baltimore BBQ, Chaps is always top of the list. 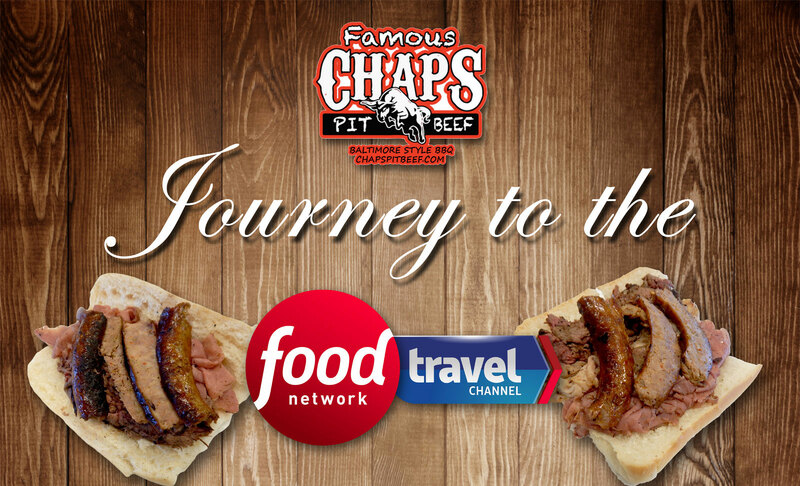 Chaps Pit Beef appears on the Travel Channel’s Food Paradise episode “Go Big Or Go Hungry” which airs as episode 5 of season 11 on May 13, 2018. The episode features the meaty portions you can get at Chaps Pit Beef attracting even more meat lovers to the growing franchise. On November 3, 2018, CBS spotlights Chaps Pit Beef’s rise to fame and all the delicious foods on the menu: Chaps pit beef, turkey, pork, BBQ chicken, ribs, ocean fries, baked beans, green beans, Cole slaw and potato salad. Chaps’ rock star status solidifies as Chaps get ready to open more locations. In “Tastebuds: Chaps Pit Beef brings classic Charm City to Frederick” published in The Frederick News-Post on June 20, 2018, a reporter shares the opening of Chaps Pit Beef’s new Frederick location as the franchise continues to expand. Looking back, Creager said that The Wire really gave them recognition they needed and helped them attract a lot of new Baltimore City customers from it, especially as the show grew in popularity. And then when Guy Fieri took notice and featured Chaps on his show Diners, Drive-Ins and Dives, more and more media requests started rolling in. Creager said that they even went out to California to cook for Fieri’s birthday. Creager explained that while they also got attention from print and TV media with mentions in The New York Times, The Huffington Post and The Washington Post, that it was the Food Network and Travel Channel rock stars that really had the biggest impact. From their little spot in Baltimore they would get calls from Russia and Ireland and the Prince of Jordan even would send a courier for food every time he was in Washington D.C. And now Chaps Pit Beef is one of the top franchises out there. “Without all this publicity, I don’t know if we would have been able to franchise,” she said. “People would drive an hour for a Chaps Pit Beef sandwich and more people began asking to see a Chaps in their hometowns. “They want something different from a burger in their area. Grilled sandwiches are our calling card and it is a healthier option too,” she said. See what all the fuss is about and visit a Chaps Pit Beef for lunch or dinner. Buy a #TripleD or #Richwich sandwich and Chaps will donate a portion of the proceeds to the Maryland Food Bank. For more information about Chaps Pit Beef and how to open a BBQ restaurant, contact us today.